Muscletech Pump Tech represents a new era in Nitric Oxide pump stimulator supplementation because its research-driven formula includes functional ingredients designed to boost Nitric Oxide levels through four distinct pathways, not just one. This makes Pump-Tech the cream of the crop in pump-stimulating technology. did nothing in the gym.made my pumps in my orgasim faster thats about it. I am a female, I work out in school for an hour a day, I am going to sign up to a gym in two weeks but today is my first day of taking Pump Tech it gave me such a good adrenline rush!...I only weigh 111LBS and I am 5'2 and I bench 115max. I dont know if I should be taking 10pills a day...? Should i still take them if I do not work out the same day? 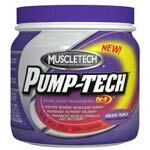 I thought I'd switch back to muscle-tech again after my long usage of BSN supps. Then I saw MS Pump-Tech, the container looked attractive but the ingredients weren't anything out of the ordinary but they probably would give me a long lasting and serious which I needed. This is my third week using it and I have gained 15 pounds of bench and 20 pounds on dumbell curls. MS is right, it should get u pumped, a little to pumped at the point where you wanna knock some out. U know what I mean, all that sudden anger is produced from these types of supplements. I don't know what to say. This is just another Pump NO2 supplement. Nothing innovative, but it does work.